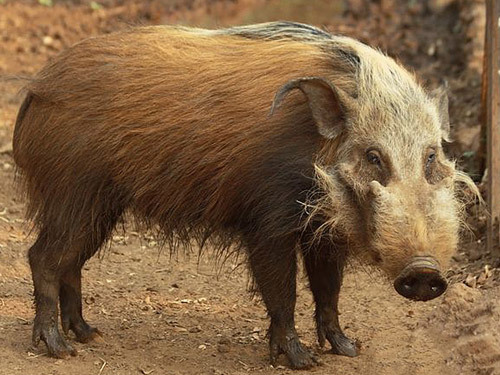 The African equivalent of the European Wild Boar and the U.S. Feral Hog, a Bush Pig weighs in around 60kg and stands around 75cms at the shoulder, the female of the species being slightly smaller. A little smaller that the European and U.S. wild pigs, the Bush Pig is a hirsute animal, varying in colour from greyish brown to dark brown as he gets older and he is every bit as aggressive and bad tempered as most wild pigs seem to be. Bush Pigs have short, sharp tusks, which can inflict serious wounds. Bush Pigs live in groups of 6 – 10 with a dominant male and female, with subordinate females and youngsters. Bush Pigs are hunted in thick bush, where they lay up during the day. However, Bush Pigs are best hunted at night, the time when they are most active. Rifle calibres should be .270 and upwards. Shotguns loaded with solid slugs are also effective. Groups of Bush Pig with youngsters can almost be guaranteed to be aggressive and though they provide an exciting stalk, be careful and wary with this species, especially if following up on one wounded, they can be extremely dangerous.